ACMETOP wine preserver-wine bottle vacuum stopper saves the wine with natural fresh smell and taste up to 10 days after the bottle was opened. PRESERVE WINE FRESH: wine bottle vacuum stopper take extra air from your wine bottle, keeping the wine tasting fresh for 7 days after the bottle was opened. Suitable for all Red and White Wines. EASY TO USE: 1. Insert the wine stopper into the bottle mouth. 2. Pump the air out until you fell strong air resistance 3. the pumping rod rebounds around 1 minutes depends on the rest wine. DURABLE AND HEALTHY MATERIAL: The stopper is made of sturdy and health PMMA material that can last life time. All the aluminum alloy, silicon, rubber material are guaranteed to be safety and food-grade, approved by American FDA and international SGS. IDEAL GIFT CHOICE FOR WINE LOVERS: Simple fashion design of wine savers stoppers kit is a perfect gift idea for a wedding, Christmas, anniversary, birthday, or for any wine lover. 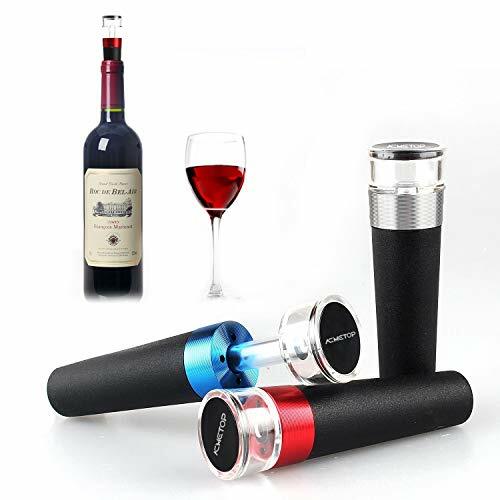 WHAT YOU GET: Light grey gift package, 3 wine stoppers including 1 silver, 1 red, 1 blue , user manual, and 12-momth warranty with 30 days return. If you have any questions about this product by ACMETOP, contact us by completing and submitting the form below. If you are looking for a specif part number, please include it with your message.